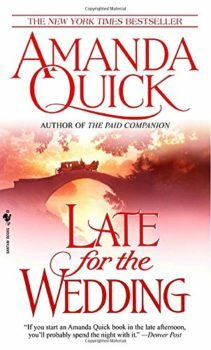 In this most entrancing tale of mystery and romance by the New York Times bestselling author Amanda Quick, lovers and partners-in-crime investigators Lavinia Lake and Tobias March continue their exciting newfound relationship, with its delicious mix of risky business, rising passion, and now–murder. 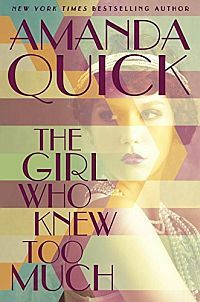 As if a head for business and a nose for trouble aren’t enough to distinguish fiercely independent Lavinia Lake from the other women of London’s fashionable Claremont Lane, there is one more feature to set her apart. Lavinia is also well versed in the practice of mesmerism, an extraordinary gift that far surpasses mere charm and physical appeal. Nobody knows this better than the usually coolheaded Tobias March, who seems to have fallen hopelessly under her spell. Fortunately for all, however, Lavinia uses her powers for good. And ever since a tragedy involving one of her subjects, she has even retired them in favor of her work with Lake and March, a joint venture providing “discreet private inquiries for individuals of quality.” Celeste Hudson, the stunningly beautiful young wife of a family friend and fellow mesmerist, would surely count herself among such individuals–were she still alive, that is. While mythology’s Medusa could turn men to stone, lovely Celeste was more accustomed to turning them to jelly. In fact, unbeknownst to her husband, Howard, the ambitious Celeste was planning to use her talents to forge a new future in Society–one that would not include him. Sadly, her plans were cut short when she was murdered. Only a gentleman’s cravat wound around her lovely neck remained for evidence–small compensation for the strange and priceless bracelet that may have been snatched from her wrist as she drew her last breath. As a result, Lake and March are soon in Howard Hudson’s employ on the trail of the killer. But Tobias is convinced the dashing widower is more interested in tracking down the missing relic. If so, Howard is not alone. Any number of ruthless types are after the very same antiquity, whose centerpiece is an unusual blue cameo of inestimable value and supposed legendary powers–powers of immeasurable worth to anyone in Howard’s line of work. Together, Lake and March undertake a tantalizing investigation that leads them from the glittering ballrooms of the ton to London’s seediest taverns to a mesmerist whose therapies include treating ladies suffering from “hysteria” is a a most unconventional method–and, not least of all, to the darkest reaches of men’s psyches. 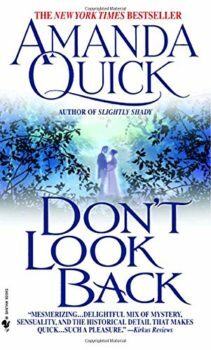 Along the way, Don’t Look Back becomes a completely mesmerizing read as the irrepressible Lavinia and Tobias mix business with pleasure….